Eight Tigers were taken in the 2011 Major League draft from June 6-8. The eight picks tied for 11th-most in the nation and tied (with Virginia) for most by an ACC team. Vanderbilt led the nation with 12 draft picks. Two Tigers were chosen in the second round on June 7. Junior shortstop Brad Miller was a second-round draft selection (#62 overall pick) of the Seattle Mariners, while junior utility player Will Lamb was also a second-round draft pick (#83 overall pick) of the Texas Rangers. Four other Tigers were drafted on June 7. Junior infielder John Hinson was a 13th-round draft selection (#400 overall pick) of the Houston Astros. Senior outfielder Jeff Schaus was a 16th-round draft pick (#494 overall pick) of the Los Angeles Dodgers. 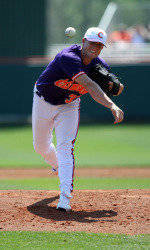 Sophomore righthander Kevin Brady was a 17th-round draft selection (#518 overall pick) of the Cleveland Indians. Sophomore lefthander Joseph Moorefield was a 26th-round draft pick (#786 overall pick) of the Kansas City Royals. A day later on June 8, two more Tigers were drafted. Senior outfielder Chris Epps was a 45th-round draft selection (#1360 overall pick) of the Houston Astros. Junior righthander Scott Weismann was a 46th-round draft pick (#1389 overall pick) of the Chicago Cubs. With the eight selections, Jack Leggett has had a total of 90 players drafted in his 18 seasons as head coach at Clemson. A total of 16 of those 90 players were drafted twice, meaning a Tiger has been drafted 106 times in his tenure. Thirteen more Tigers have signed free-agent contracts as well.